Prominent among the foremost citizens of Pocahontas is John Clay Williams, who is actively identified with the financial prosperity of Bond county as a banker, and as a man of enterprise, ability and integrity is closely associated with the advancement of the material interests of town and county. A son of William Davis Williams, he was born August 8, 1859, in Saint Jacob, Madison county, Illinois, of brave pioneer stock. His grandfather, Aaron Williams, a native of Maryland, was a youth of a daring and venturous spirit, who in his search for fortune made two trips on horseback to Illinois while it was yet wearing territorial garb, one in 1815 and one in 1816. 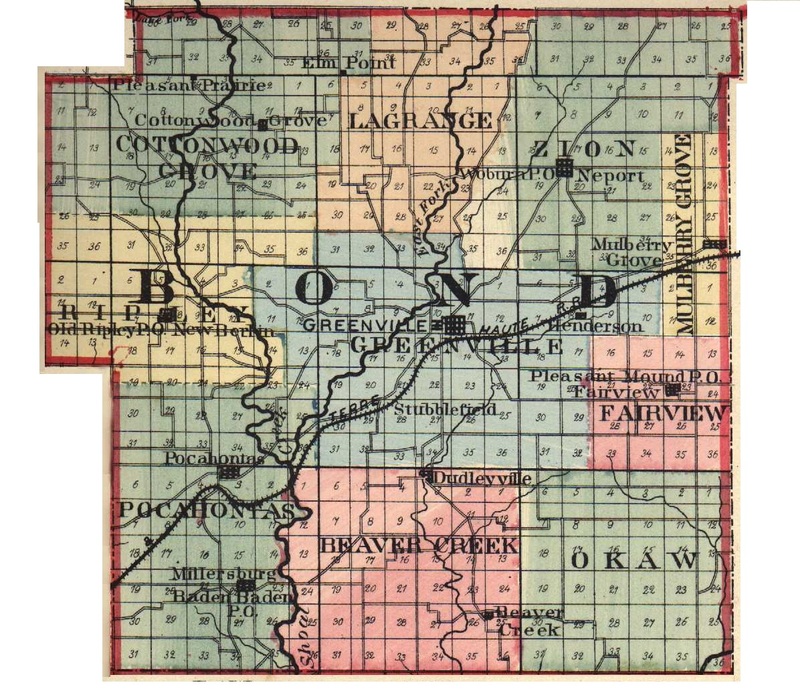 In 1818, just as Illinois was admitted to statehood, he came from Baltimore to Fayette county, Illinois, locating in Vera, where he took up a tract of wild land, from which he improved a farm. He married Sarah Barton, of Saint Clair county, Illinois, and was thereafter engaged in tilling the soil until his death. Born on the parental homestead in Fayette county, William Davis Williams received a practical training in agriculture while young, remaining beneath the parental roof -tree until after attaining his majority. In 1849 he joined a band of gold seekers and made an overland journey to California, where he followed mining for six years. Returning to Illinois in 1855, he settled in Saint Jacob, Madison county, where he was engaged in general farming until 1891. Coming then to Pocahontas, Illinois, he lived retired until his death, in 1899, making his home with his son. Soon after his return from the Golden state he married Ellen Virginia Hayes, of Saint Jacob, who died nearly a quarter of a century before he did, passing away in 1875. He belonged to the Baptist church, and was an active member of the Ancient Free and Accepted Order of Masons, with which he united in 1855, at the time of his death being one of the oldest and most highly esteemed members of the lodge. He took great interest in local affairs, and held various offices of trust, having served as school director, while for many years he was township supervisor. The oldest son and second child of his parents, John Clay Williams lived on the home farm in Madison county until twenty years of age, when he went to New Mexico on an exploring expedition. Finding nothing to specially interest him in that unsettled country, he returned to Saint Jacob, where he was engaged in general mercantile pursuits until 1883, being junior member of the firm of Karges & Williams. Sell: ing out his interest in the firm in that year, Mr. Williams became traveling salesman for a wholesale house, with which he was connected in that capacity for five years. In the meantime, however, in 1884, he had bought back his interest in the firm of which he had formerly been a member, and, in company with Mr. Louis Ryan, continued the business under the firm name of Ryan & Williams. Giving up traveling in 1889, Mr. Williams was actively engaged in business as a merchant at Pocahontas, Bond county, until 1905, being quite successful in his operations. In that year, in company with Mr. P. M. Johnson, of Saint Elmo, Illinois, he established the Bond County Bank, a private institution, and has since carried on a substantial business. In 1899 Mr. Williams was appointed postmaster at Pocahontas, and has held the position since. Mr. Williams married, in 1893, Naomi Olive Lindley, of Pocahontas, a woman of culture and refinement, eminently fitted for the duties of wife and mother. She passed to the life beyond in November, 1908, leaving five children, namely: John L., Benjamin Oliver, Marie, Ellen Virginia and Joseph Aaron. Politically Mr. Williams ever supports the principles of the Republican party, and religiously, there being no church of his own faith, the Baptist, in Pocahontas he attends the Methodist Church, and is serving as one of its trustees. Fraternally he is a member of the Ancient Free and Accepted Order of Masons; and the Order of the Eastern Star; of the Independent Order of Odd Fellows; of the Modern Woodmen of America; and of the Knights of the Maccabees. Extracted 10 Nov 2018 by Norma Hass from 1912 History of Southern Illinois, by George W. Smith, volume 3, pages 1556-1557.